One of nature's more exotic treasures, rhodochrosite is a manganese carbonate that gets its name from two Greek words: "rhodon," meaning rose and "chros," meaning color. A fitting name indeed as its finest colors range from very pale pink, pale to deep orangey red. Yellow to brown crystals are also known. Clean, transparent, facetable material is extremely rare and highly sought after by gem collectors. 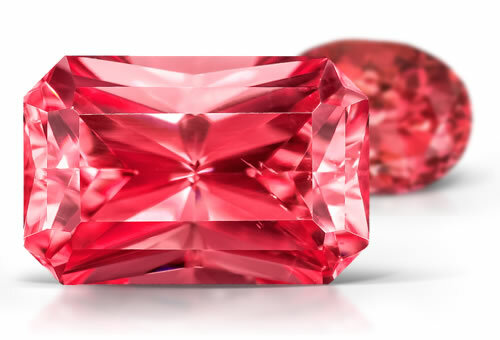 Faceting such crystals presents a challenge to cutters due to the gem's perfect cleavage in three directions. Semi-translucent to opaque rhodochrosite is often carved or cut en cabochon and typically displays "bacon strip" or "bull's eye" patterns. RI, birefringence and spectrum. Use birefringence blink method. Stones have eye visible doubling. Rhodochrosite typically has many liquid and 2-phase inclusions.